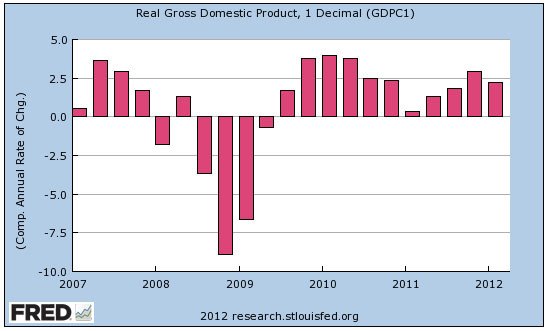 I suppose I should do a pro forma post about today’s GDP announcement, so here it is: GDP increased 2.2% last quarter. The general consensus is that this is “meh.” It’s not great, especially for an economy supposedly coming out of a recession, but it’s not horrible either, and it might get revised upward next month anyway. Bottom line: if it’s a blip, it’s no big deal. If it’s the first sign of a slowing economy, it’s pretty bad news. But we’ll have to wait and see. More details here.